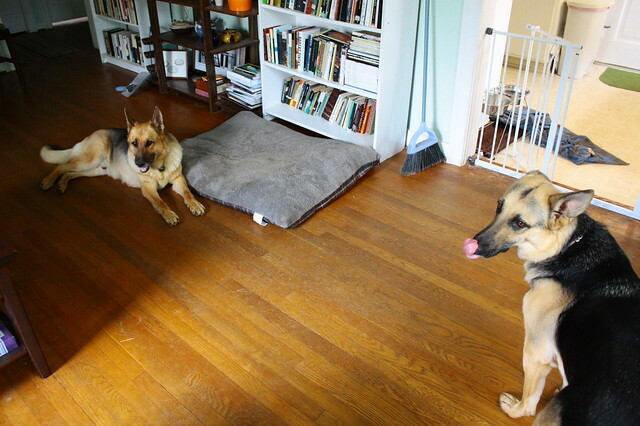 Before we adopted Eden, we fostered six German shepherds for a shepherd rescue in our region. Eden was our sixth foster, and we decided to keep her, that little terror. We haven’t fostered since Edie, but it was a great experience for us and especially for our shy dog, and I’d love to do it again. Serving as a foster home for a dog is a wonderful gift both to the dog and to her future family. By welcoming this dog into your home and teaching her how to live peaceably with people, you are setting her up for a successful life and reducing her chances of getting returned to a shelter or rescue. Pyrrha with Trina, one of our foster puppies. Here are 10 things I learned that I would want to share with any prospective foster parent. 1. Start slow. 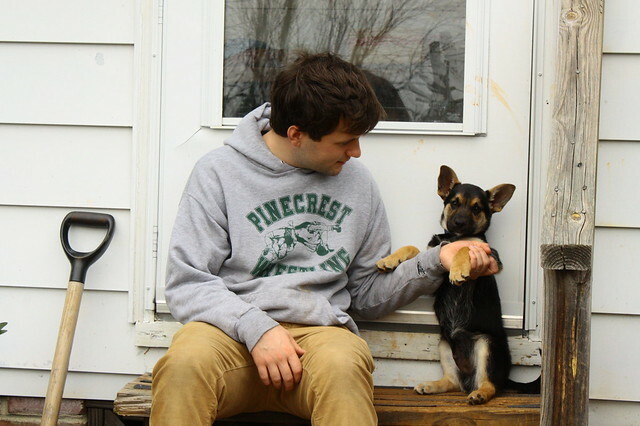 Make introductions to people and your pets with gentleness and caution. Moving is stressful for everyone, and moving into a new home with new people will likely cause even the most gregarious dogs a bit of stress. Go slowly on your first day. Don’t take her to the park or to a busy pedestrian mall that first week. Don’t mob the dog with too many new people during the first week, and be especially careful and slow when introducing your foster to your other pets and children. Pyrrha and Rainer giving each other space and exhibiting some calming signals. 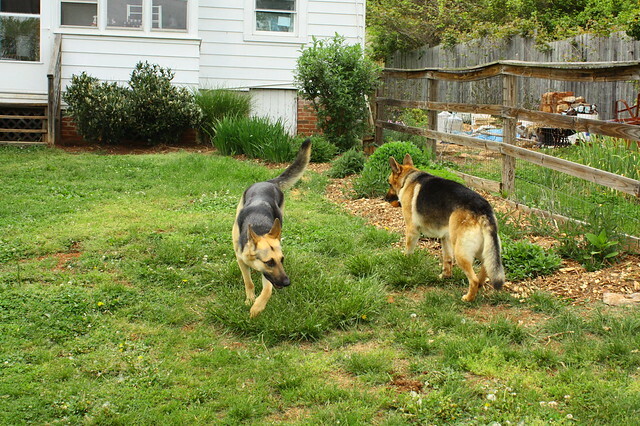 Introduce dogs in a low-stakes environment, with plenty of outdoor space for them to navigate. One of the best techniques, I think, is to enlist the help of another human and have both dogs on leash in a wide, open area. Walk the dogs parallel to each other a very large distance apart (20 feet or more), so the dogs can see each other and get a whiff, but not get too close to interact. 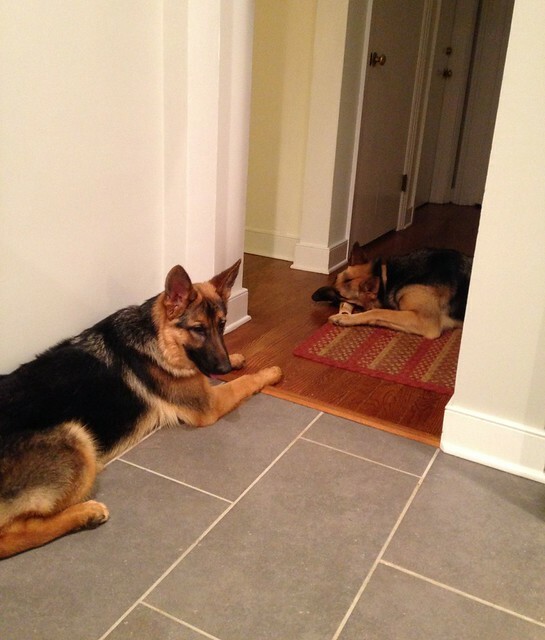 If that seems to be going well and both dogs seem calm, start moving a little closer. Really LOOSEN UP on that leash when they get close enough to touch each other. You don’t want to transfer any tension at all. 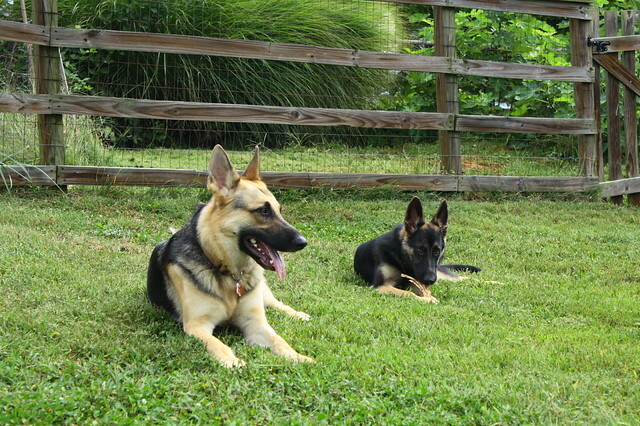 Then, when ready, let them get to know each other off leash in a fenced area, if possible. 2. Assume that all dogs are not house trained. Start house training on Day 1. 3. Use crates and baby gates. Crates and baby gates will be your best friend as a foster parent! They will help you both house train and keep an eye on your new foster, especially during those critical first few weeks. Follow basic positive reinforcement guidelines with crates. Crates are happy, safe places; never use them to punish a dog. Feed meals in crates if the dog is having a hard time getting adjusted. Treat and praise the dog for entering the crate, and start training a “crate entry” cue (we use “Go to your house!”) for bedtime. Once your foster is comfortable in your home and sufficiently house trained, start exposing him to the wide world. Observe how he performs on car trips. How does he behave at the vet? Is he anxious or leash-reactive to people or other dogs on walks? If possible, introduce him to a wide variety of people, children, dogs, and cats, always under very close supervision, so that you can develop a more complete adoption profile for your foster. 5. Take tons of photos and videos! High-quality photos and videos are one of the best ways to attract potential adopters. Smartphones obviously make this very easy, so take photos and short videos of your foster all the dang time. Post them on the rescue website and share the heck out of them on social media. Handsome Draco, one of our former fosters. Really, this is one instance in which more is more. There is no such thing as too many photos of your foster dog! 6. 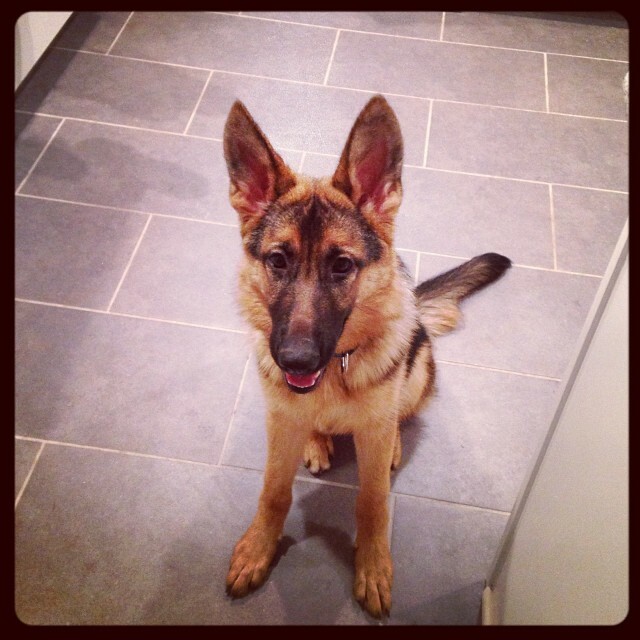 Teach the dog basic commands after she has settled in. Using positive reinforcement and plenty of praise, start teaching your dog some basic life behaviors that humans appreciate in dogs, such as waiting politely to be fed, not pulling on the leash, sitting, and staying. This is not only a way to impress future adopters but also to build a bond of trust with your foster dog—and improve her chances that she won’t be returned. 7. Put the dog on a high-quality diet. Dogs coming from rough backgrounds (e.g., from a hoarding situation, like our foster Draco; or from the streets, like our foster Rainer) generally have had poor nutrition, and one of the best things you can do right off the bat is switch them to a high-quality diet. Whether you feed raw or a quality kibble, it’s so immediately helpful to begin your foster on a nutritional diet. Your shelter or rescue organization will likely help with any vet check-ups and the transfer of any background information, but be sure to keep all vet records, bills, and information in a neat and tidy manner. This will obviously be important and helpful to your foster dog’s future family. Take good notes on the dog’s health as well, even beyond official vet visits. You will be the best person to assess the general well-being of the foster, and so take vigilant notes about what you can observe of your foster’s wellness. 9. Be honest about your foster dog’s behavioral issues. 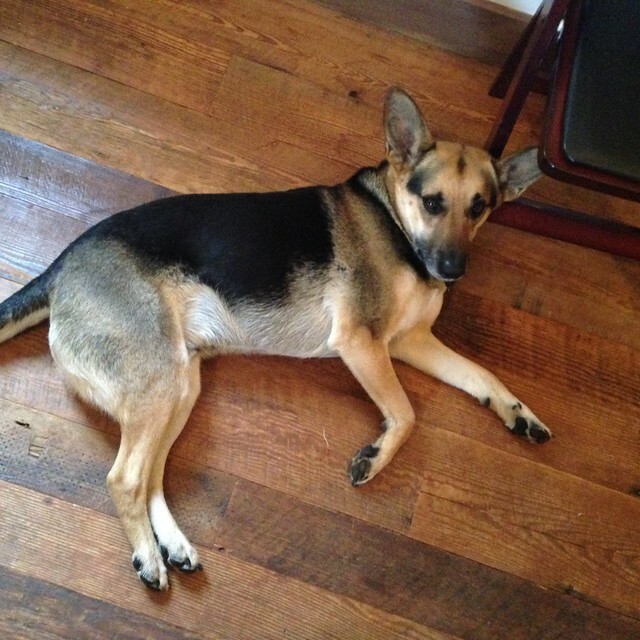 It’s a disservice to your foster dog and to her potential family to gloss over her issues. We all have issues, and the more open you can be about your foster dog’s, the better off she will be in the long run. When writing about your foster dog, start with all of her great qualities! Lead with the positive. But don’t leave out the things she will need help with. With our fosters, each one had a different and specific issue or set of issues that their future families would appreciate knowing about. 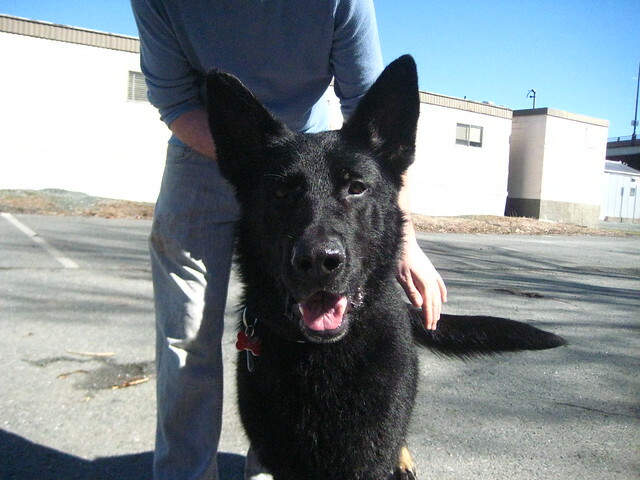 Brando had a touch of separation anxiety and needed more work with polite walking on leash. Trina was easily startled by new people. Draco had a severe (genuinely heartbreaking) fear of bearded men. 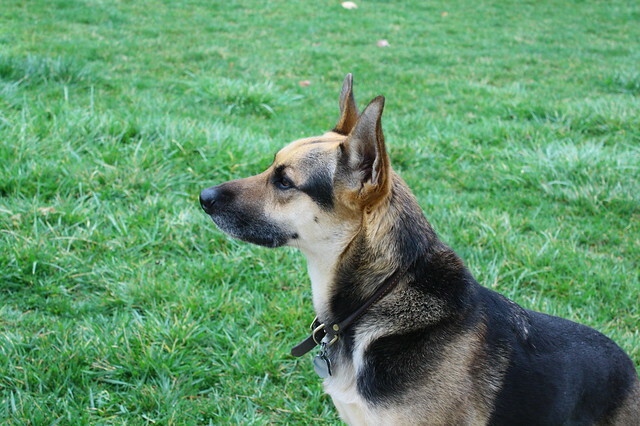 Rainer became almost catatonic when he had to ride in a car, and he was extremely dog aggressive when on leash. You want to find the best (and most permanent) home for your foster, so you want to be upfront about your foster’s issues. Ensure that she goes to a home who is fully aware of and fully committed to helping her become a happy, well-adjusted dog. 10. Envision and describe the perfect family for your foster. 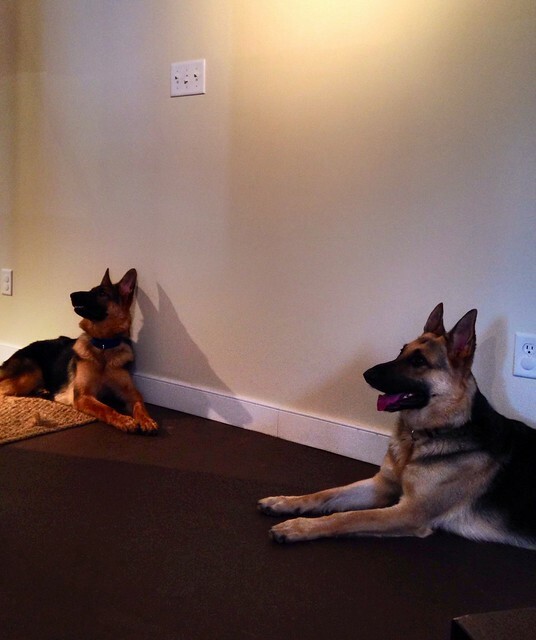 As you live with your foster dog, start envisioning the perfect home for your foster. Where would she be most likely to thrive? What makes her happiest? Would she love a family with children? Or would she do best with just a single woman? Does she love other dogs? What are her exercise requirements? Happy Draco with his new dad and his (canine) sister. Be clear in your expectations for your foster’s future family but also be open to being surprised. On paper, I pre-judged an applicant for a foster dog, but I was totally wrong in my assumptions, and the foster and this young man were the perfect fit for one another. Seeing them interact was all of the confirmation I needed. You’ll know when it’s right. And you’ll be full of joy (and a little bit of wistfulness) when you send that pup on his merry way. Have you fostered before? What other tips would you add? 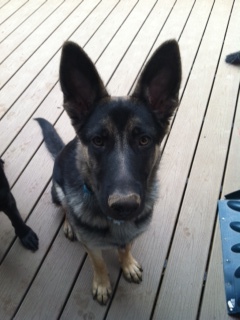 Anyone remember Laszlo, our foster puppy from Southeast German Shepherd Rescue? He was just a little guy when we had him, back in April 2013. I got the pleasure to see him again this past March, when I taught a calligraphy workshop at the vineyard where his person, Tracey, works. What a handsome little dude! 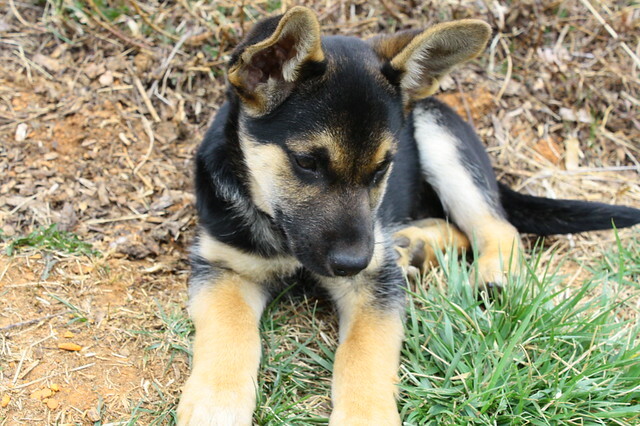 He looks like a miniature German shepherd, with macro ears. He has turned into a fantastic dog, and he is so well-mannered and calm. I taught the workshop for about three hours, and he camped out like this in the room with all of us, like a complete darling. Tracey has done a marvelous job with him. He gets to roam around the winery with her all day and behaves himself beautifully with people, children, other animals. 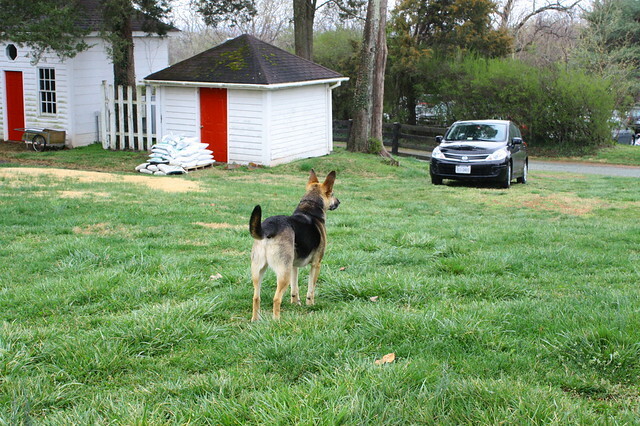 He also is still loving life with his big sister, BB, a German shepherd, and a gigantic cat out on their mini farm. It does the heart good to see a former foster thriving. Laszlo has a great life, and I couldn’t be happier for him. 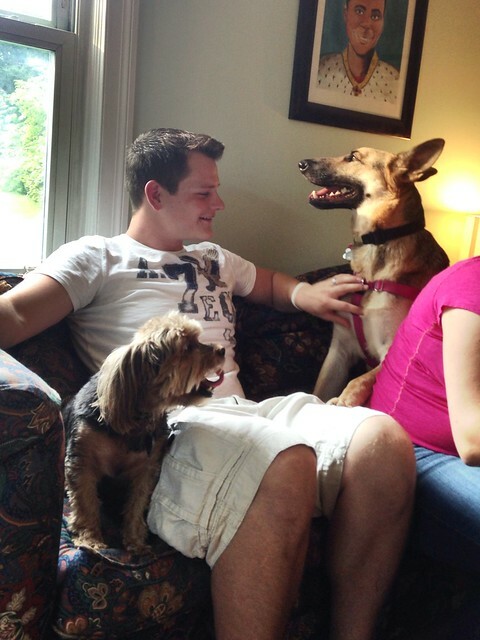 If you fostered, do you ever get to see your former fosters? 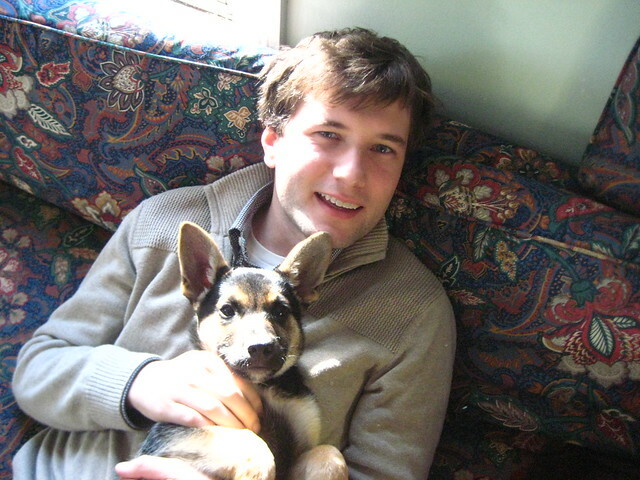 And happy 29th birthday to my husband, whose compassion for animals qualifies him as a good man, and who very patiently puts up with my dog craziness. 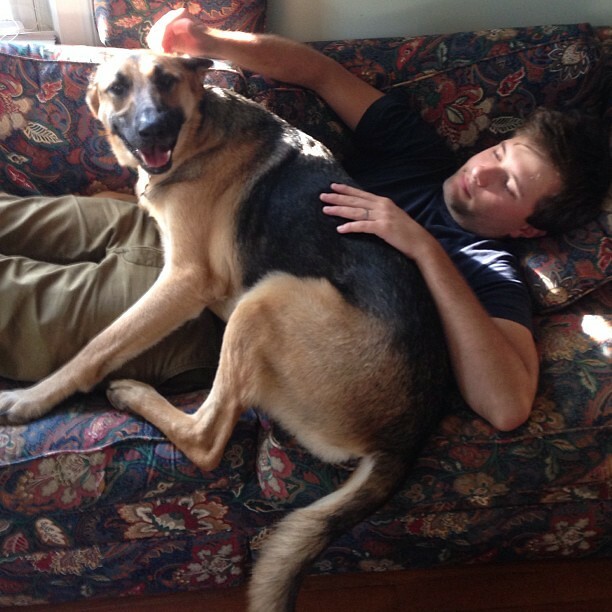 Those of you who have been reading along here for a while may remember Rainer, the shy, foxy-looking German shepherd who we fostered for a little over four months. Rainer was so gentle toward us and toward Pyrrha, but he had some serious territorial aggression toward other dogs, and he once tried to kill (actually kill, not just scare off) a potential adopter’s male dog — a terrible, terrible day which resulted in several ER visits for humans and dogs. He also showed lots of aggression toward baby Georgia when she came to visit, and he was always riled up by seeing other dogs on walks. For this reason, when he was adopted by a young Marine, we counseled him to be extremely cautious with Rainer and other dogs and to continue the positive reinforcement training around his fears. That said, Rainer certainly had the potential to be good with other dogs, because he loved Pyrrha, and she loved him; they never had a serious quarrel. 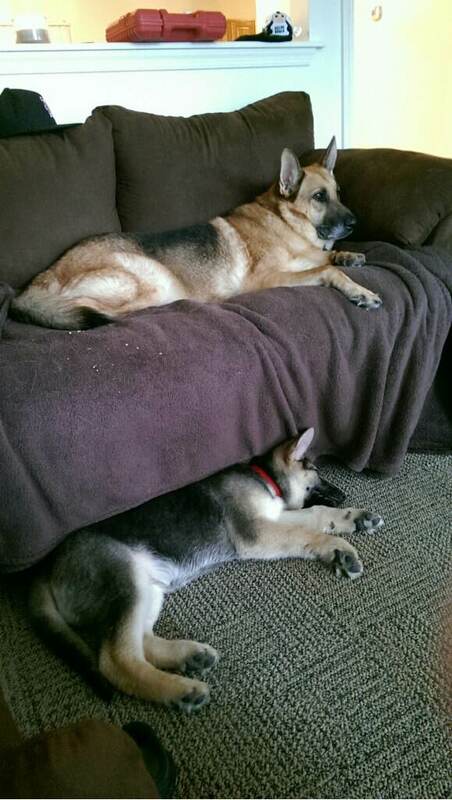 Former foster dog Rainer (on the sofa) with his canine sibling. I’ll take it! I’m always amazed at how much our former foster dogs have grown and matured since we had them in our home. Rainer was perhaps our hardest case, and I can’t say how much joy it brings me to hear that he is doing well — and coexisting peacefully with a sibling. 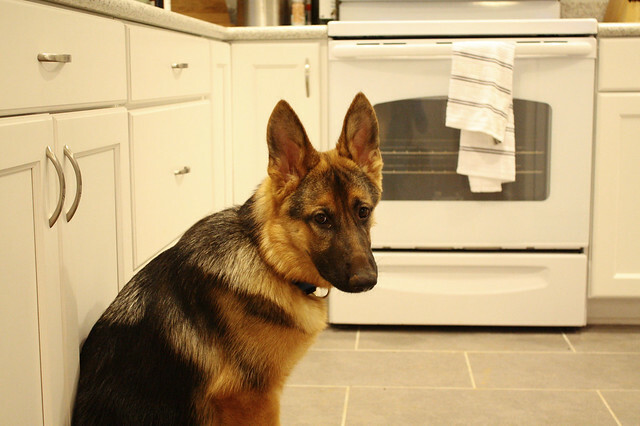 Have you ever been surprised by a dog’s behavioral change, particularly once he or she was in a new environment? I always really appreciate it when the adopters of our former foster dogs stay in touch. Their e-mails and photos are so heartwarming! I wanted to give you guys and update on Kira. She gets more accustomed to her new home with every passing day; she is so smart. She loves the snow and is getting big. Attached are pictures of her. Can’t believe how big she’s getting! She almost looks like a full-grown lady. And he is right: She is SO smart. One of the smartest dogs I’ve ever met. So happy that she has found her forever home. We were tempted to keep her ourselves, but I know she’s in just the right place. And that’s the best feeling of all! Hope you all have great weekends ahead! A week before Christmas, I got an e-mail from the rescue VP that made my heart skip a beat. She said she had the perfect puppy for us. We had a crazy fall and early winter, and so we took a fostering hiatus. But I also wanted us to start thinking seriously about a second dog for our household, and I was really picky about this future dog’s personality. 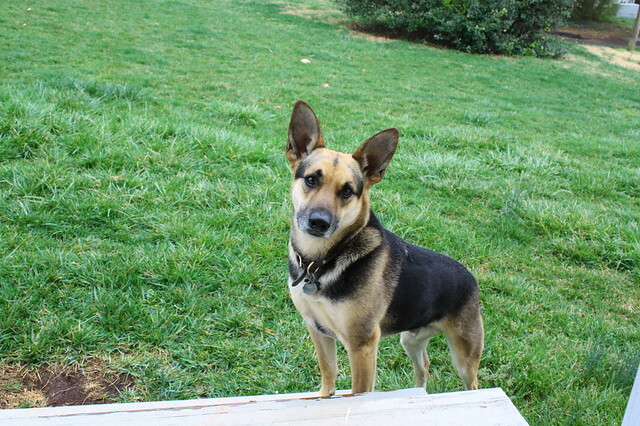 Cassie (the rescue VP) knew that I was looking for a “bombproof” young dog to balance out Pyrrha’s fear issues (see this great post by Nicole Wilde). She said that she’d only met one other puppy who was as solid as this one was, and she kept him for herself. This puppy had been surrendered by her family, who had young children and felt that they could not give her the attention she needed. So, on a very rainy Sunday, I went to meet Cassie and pick up Eden! We met at Petco, and I was instantly impressed by Eden’s confidence, friendliness, and utter lack of fear. 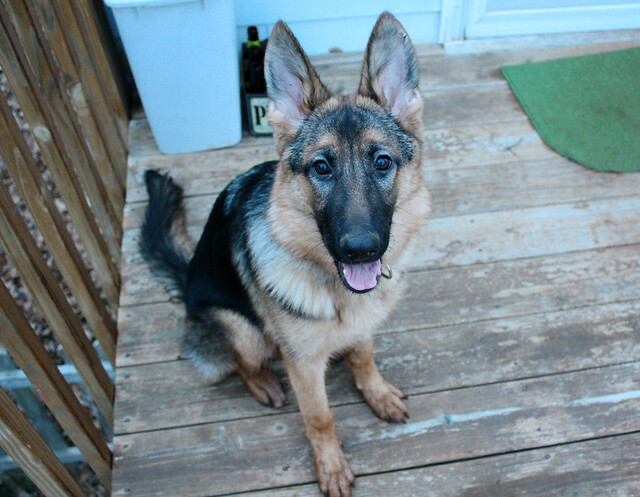 From Pyrrha and our GSD experience so far, I’ve come to expect shyness from every German shepherd I see, and here was a little girl who didn’t have an ounce of it. She greeted everyone who walked in the door with wags and kisses. Eden (fka Eva) was evaluated for police work when she was brought in, but failed the police test for not having high enough drive and being too friendly. Which is totally fine with me! But the evaluator did say that she thought Eden could be perfect for therapy work, owing to her strong orientation to people. I really thrilled to hear that; I’ve always dreamed of having a dog who could do therapy service, and Pyrrha certainly isn’t suited for it. We still have two weeks to make everything official (the rescue’s policy of having a trial period) but… all signs point to this girl being THE ONE. Guion is always more level-headed than I am with puppies, and so I think it’s good that we have this period of being able to decide about her, but I think he’s also smitten with her. Eden plays with Pyrrha very nicely, and Pyrrha treats her with a mix of joviality and crankiness (which is always her way with puppies; Pyrrha, despite only being 2, has some aspects of old lady grumpiness with the whippersnappers). They love romping together in the yard (and sometimes in the house), and I think Pyrrha will really warm to her. Edie is also good about respecting Pyrrha’s space (and Pyrrha is good about letting her know when she’s crossed the line). As with all of the other fosters we’ve had, I have to be conscientious about helping Pyrrha with her jealousy issues regarding me and other dogs, but she’s been good about keeping them in check. Her main tendency is to be the taskmaster/bullying older sibling with young’uns, which is a behavior I myself exhibited as a child, so I’m familiar with the signs. But Eden is very happy and forgiving of Pyrrha’s occasional grumpiness, and she thinks Pyrrha is a delight. 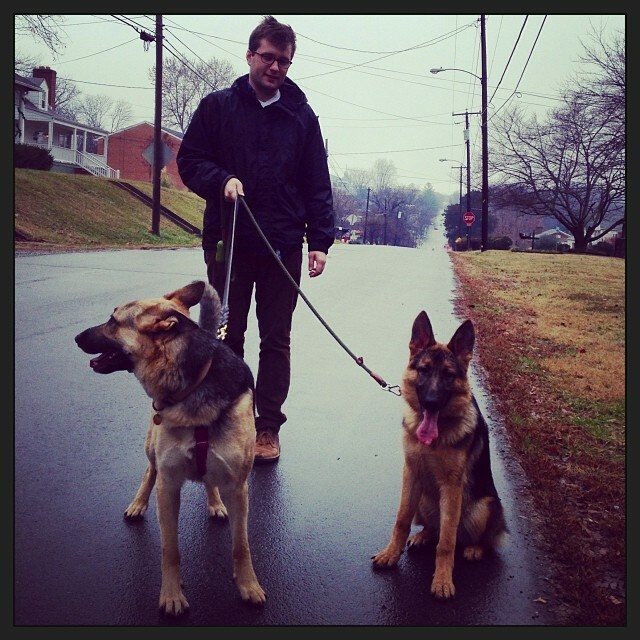 We took them on a 2-mile walk around town on Wednesday, and they were great together. Eden’s happiness and friendliness to everyone seemed to let Pyrrha loosen up. We’re still working patiently on Pyrrha’s leash reactivity issues toward other dogs, and Eden has already shown strong signs of being a great young role model for Pyr. 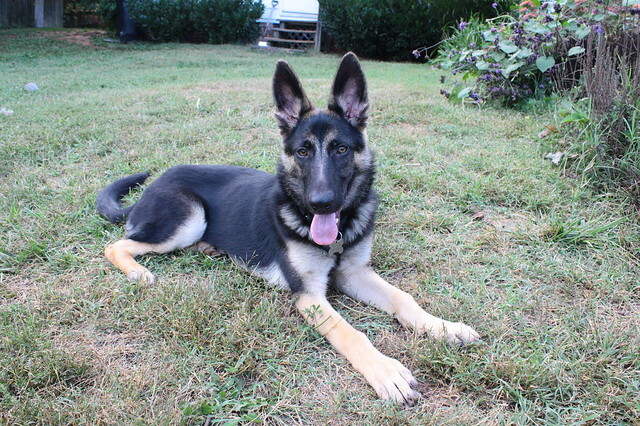 From my research and from the existence of Eden’s pink papers, I’ve been able to determine that she came from a Maryland breeder and schutzhund competitor. 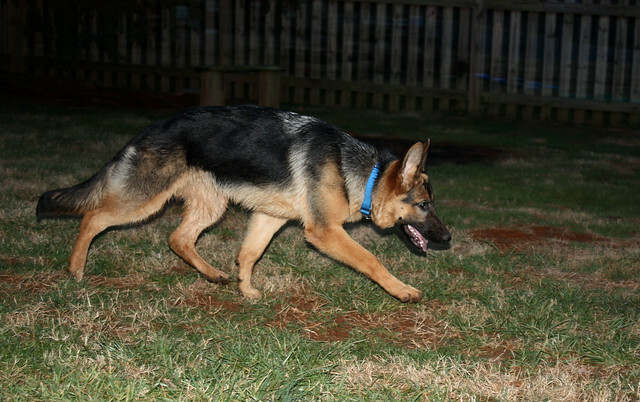 Eden’s parents were both imported from Germany, and both are titled in schutzhund (her father holding a Sch3 title). Their hips and elbows both passed as “normal” by the German breeding standards, which was good to know. She does have more angulation than Pyrrha, which I hate, but she moves and runs solidly. 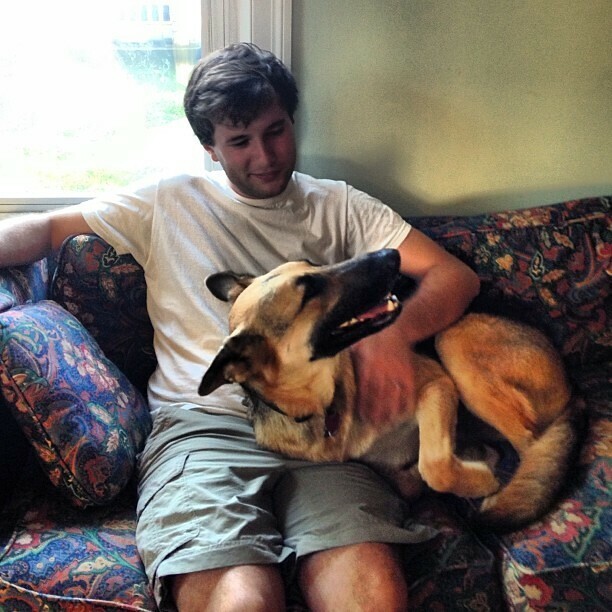 Getting a purebred rescue is always a gamble, so we’re lucky to know this much about Eden. (And can you believe that a puppy of this caliber was turned into a rescue?? It happens!) 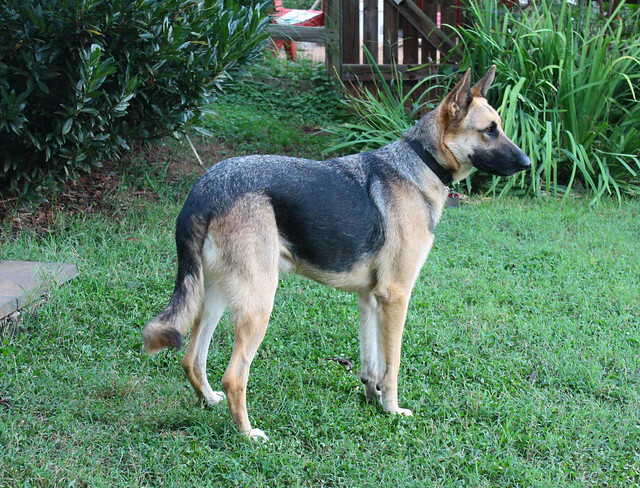 German shepherds are famous for their health issues, and this is a risk we knew about when we started looking at GSD rescues. We know nothing about Pyrrha’s parents, except that they were from the (weaker, unhealthier) American show/companion lines and not bred well (an unscrupulous backyard breeder who wanted to euthanize all of his dogs because he was tired of them). Despite this, Pyrrha is healthy, and we are blessed. We know more about Eden, but we also have high hopes for her healthy future as well. And she’s a funny, playful, floppy bundle of energy! Whew! She wants to play ALL DAY long. I’m really grateful for Pyrrha, who can wear her out in the backyard with games of tag and wrestling matches, because I can’t keep up! Eden is both food AND toy motivated, which is fun to see, and she’s a very quick learner. This little brown-noser has learned to sit sweetly whenever she wants anything, because it’s clearly a strategy that’s been working well for her. She LOVES toys, and especially toys that she can fetch. She has a retrieving drive like a labrador! But she makes fetching fun for us humans too, because she’s already learned to drop the ball at your feet and wait in a sit or down position for you to throw it. I’m impressed. We were tempted to keep Trina, our last foster, as you may recall, but I can already tell that Eden has confidence and soundness in ways that exceed little Trina. Trina was awesome, and she’s so happy in her new home, but seeing Eden is also a reminder that Trina wasn’t exactly what we were looking for. SO. Still anxious to make it official, but I think she’s IT! I can’t believe we found her. 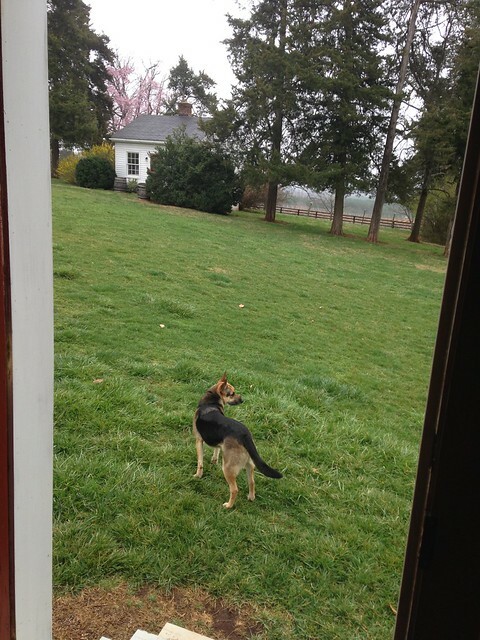 We’re SO grateful to Cassie and to Southeast German Shepherd Rescue; what awesome, thoughtful, hard-working people. We’re so thrilled! 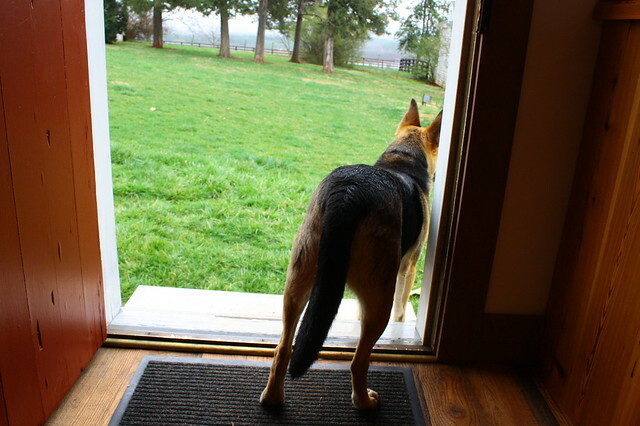 SIDE NOTE: DOGS PICKING UP UNWANTED BEHAVIORS? With regard to Pyrrha’s progress, now is a good time to add another dog to the house. If we had tried to bring in a permanent new dog even six or eight months ago, I’m not sure that Pyrrha would have been ready for it. Pyrrha has gained enough confidence and made enough progress in her other fear areas (Guion, strangers, other dogs) that I think we’re at a point at which Eden can be a good influence on Pyrrha, instead of Pyrrha being a bad influence on Eden. 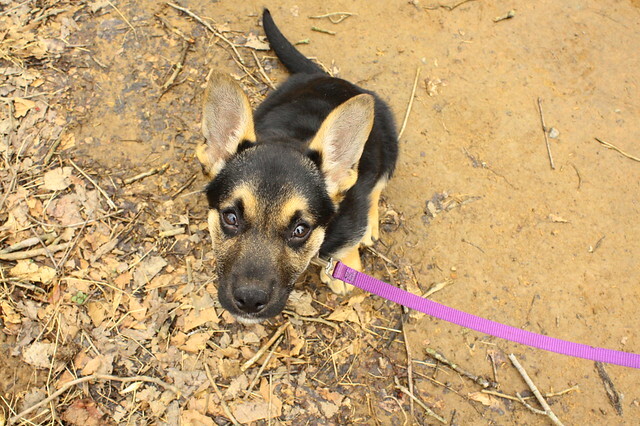 The main thing I don’t want Eden to pick up is Pyrrha’s leash reactivity toward other dogs. For those of you with multi-dog households that include a reactive dog, has this ever been a problem for you? (The reactive dog making the non-reactive dogs reactive.) If so, what have you done to mitigate such copying behavior? 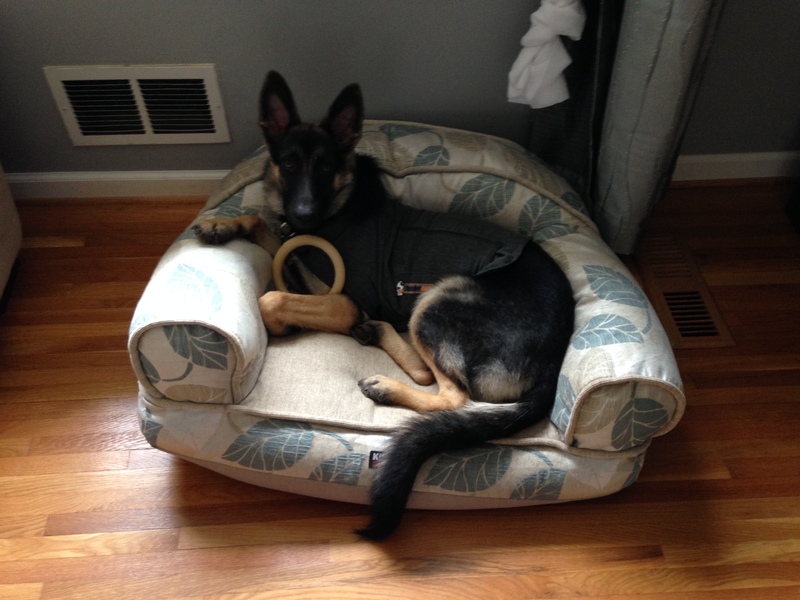 Kira (fka Trina) in her new dog bed. It looks like she’s wearing a Thundershirt here, and I’m not sure why; they didn’t mention it. I can’t believe how big she is now! She almost looks like a full-grown lady. 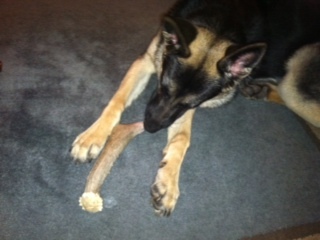 She’s such a whip-smart puppy — maybe one of the smartest dogs I’ve met — and we’re so happy that she’s in the right place. Warm, fuzzy feelings. And now back to moving/packing madness! Do you ever hear from the adopters of your fosters? Does it make your day like it does mine?